Introduction: Cell plasticity is crucial in cloning to allow an efficient nuclear reprogramming and healthy offspring. Hence, cells with high plasticity, such as multipotent mesenchymal stem cells (MSCs), may be a promising alternative for horse cloning. In this study, we evaluated the use of bone marrow-MSCs (BM-MSCs) as nuclear donors in horse cloning, and we compared the in vitro and in vivo embryo development with respect to fibroblasts. Materials and methods: Zona-free nuclear transfer was performed using BM-MSCs (MSC group, n=3432) or adult fibroblasts (AF group, n=4527). 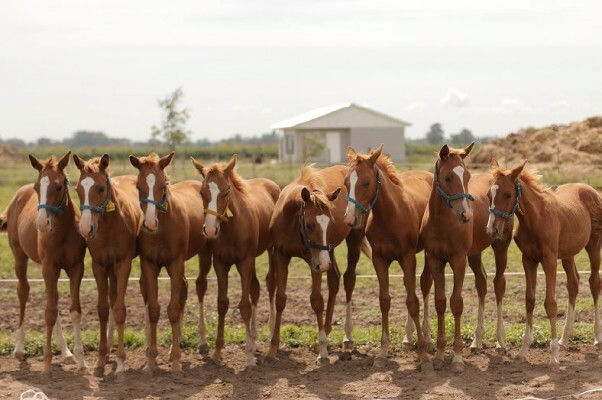 Embryos produced by artificial insemination (AI) recovered by uterine flushing and transferred to recipient mares were used as controls (AI group). Results: Blastocyst development was higher in the MSC group than in the AF group (18.1% vs 10.9%, respectively; p<0.05). However, pregnancy rates and delivery rates were similar in both cloning groups, although they were lower than in the AI group (pregnancy rates: 17.7% [41/232] for MSC, 12.5% [37/297] for AF and 80.7% [71/88] for AI; delivery rates: 56.8% [21/37], 41.5% [17/41] and 90.1% [64/71], respectively). Remarkably, the gestation length of the AF group was significantly longer than the control (361.7±10.9 vs 333.9±8.7 days), in contrast to the MSC group (340.6±8.89 days). Of the total deliveries, 95.2% (20/21) of the MSC-foals were viable, compared to 52.9% (9/17) of the AF-foals (p<0.05). In addition, the AF-foals had more physiological abnormalities at birth than the MSC-foals; 90.5% (19/21) of the MSC-delivered foals were completely normal and healthy, compared to 35.3% (6/17) in the AF group. The abnormalities included flexural or angular limb deformities, umbilical cord enlargement, placental alterations and signs of syndrome of neonatal maladjustment, which were treated in most cases. Conclusion: In summary, we obtained 29 viable cloned foals and found that MSCs are suitable donor cells in horse cloning. Even more, these cells could be more efficiently reprogrammed compared to fibroblasts.